Doberman puppies (full name Doberman Pinscher) are a very elegant and muscular dog – above all Dobermans are extremely powerful. Doberman puppies were bred for more than a hundred years to be guard dogs, and are possibly the best breed for this task. They are intense, energetic with enormous strength and stamina. Doberman Pinscher versatility and intelligence makes them easy to train – it is determined, fearless and assertive, but not generally vicious. Dobermans are very loyal and affectionate with their human family – it likes to be physically close to the family. Doberman puppies must have an owner who is willing and able to discipline the dog, without being afraid of him. It is important that all family members are taught to handle the dog properly, as Dobermans have a tendency to become 'pushy' if allowed to have their own way too much. It is essential that Doberman puppies are very well socialised at a young age, to prevent over protectiveness – continuous mental stimulation is important for a well adjusted and happy dog. 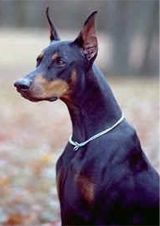 Dobermans can be good family pets if of good temperament, well trained and brought up with children from an early age. 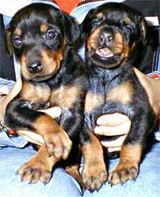 Doberman puppies must be consistently and thoroughly trained in order to be a good pet, training should be through positive reinforcement techniques. Dobermans were created in the 1880's by a German tax collector, who wanted a medium sized watch dog, to protect him while he was working. It is thought that he used Rottweilers, German Pinschers, Weimaraners and possibly Manchester Terriers, to produce the breed. Arguably, the best guard dog in existence, Dobermans are used extensively throughout the world by police and security forces. A tough and somewhat formidable animal, they will usually only attack if provoked. Our 4 Paw Rating - to the suitability of Dobermans for your home and lifestyle. Although the temperaments vary enormously between individual dogs, some can actually be extremely submissive! In general terms, Doberman puppies need early, consistent and extremely thorough training and socialising from an early age. Formal training groups are recommended.